Hello and Welcome to the first day of sneak peeks for the Sparkle Creations Rubber Stamps November release! Sparkle is releasing 2 new images at midnight EST this Saturday, November 13.. Today we are previewing Street Corner Josh! Be sure to visit her and the rest of the SCRS designers for more peeks of Street Corner Josh. Sparkle will be giving away a Street Corner Josh to one lucky person! For a chance to win, you need to comment on all of the designer's blogs (list below). Then head on over to the SCRS blog and comment on the Josh post. You have until midnight EST each day to comment. The lucky winner will be announced the following day! Mercy, fab November guest designer! Tomorrow I will be back with the entire SCRS team to preview the final image... and it's also RELEASE DAY! 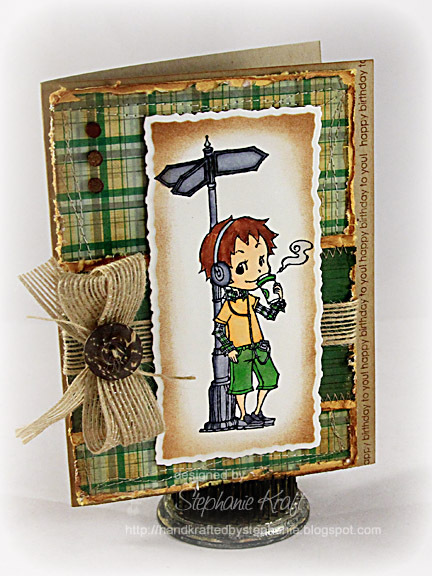 Accessories: Deckled Mega Rectangles Nestabilities (Spellbinders), Distrezz-it-All (Zutter), Markers (Copic), Button (Papertrey Ink), Bella Dots (Stamping Bella), Twine (May Arts), Natural jute ribbon, Foam tape, Thread, Sewing machine. Totally awesome Steph!!! I love the distressed look! wow, this is great! Love all the distressing, it fits the image so perfectly! I love all the distressing! And that ribbon! So fabulous! Love the vintage look! Fantastic card! I love the greens...lovely card! lovely! I am now craving for some starbucks! Love the papers, love the distressing - they work perfectly with this image. Great card. Love the ribbon & button! Thanks for a chance. Super cute card. I love the paper you used. Love the distressing and that gorgeous jute ribbon. BIG smile, this is perfect! Wow! This card is fantastic! Love all the distressing! this card is SOOOOOO CUTE!!!! love the distressing, coloring everything about this card! fabulously done, stephanie! LOVE those distressed edges, and your coloring is out of this world! awesome sneak peek! Love the vintage background and the distressing on the edges. Lovely coloring and image.